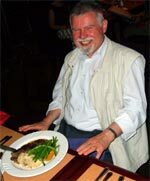 UCOG Today [Paul Kieffer] » Blog Archive » It’s gotta be steak! My fellow UCG-Germany elder Alfred Riehle knows a little bit about life in the United States. As a soldier in the German army, the Bundeswehr, he was once stationed at the Redstone Arsenal in Huntsville, Alabama. During that time Alfred developed a liking for a few things about the United States. Among them are things like country music and gospel music. Alfred has a sizeable collection of music going back quite a few years, and on more than one occasion I have been a beneficiary of his efforts when he has shared a cassette tape of selected recordings with me. But the thing that impresses me most about Alfred’s liking for the USA is his taste for American steak. For the last 10 years Alfred has attended the annual UCG General Conference of Elders meeting, and each visit to the United States is an opportunity for him to visit a steak house and have a good steak. Not that German restaurants don’t have steak on the menu or that all German beef is tainted with BSE. According to Alfred, it’s just that U.S. beef tends to be more tender and tasty. I’ll take his word for it, since I am not much of a steak eater myself. You can see Alfred’s first offering in the picture. He let me know that he had an even bigger one the next evening.